At DashBrew we are constantly investigating the economic impacts of operations from breweries. We put together a worksheet to calculate the impacts of cooperate rates on your bottom line. If you would like to download this exact spreadsheet please click here. Check out this comparison below. 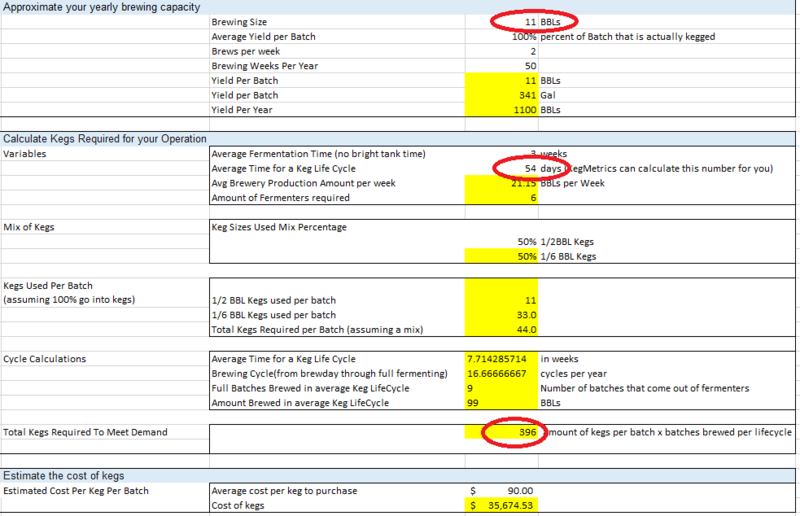 A 1000 BBL output brewery that has a 60 day lifecycle per keg needs 440 kegs to meet demand. But, if they can reduce the time a keg is out by just 10% they don’t need to use 80 kegs. This translates to saving an estimated $7,200 on the cost of kegs (about $90 per keg x 80 kegs). And that doesn’t factor in all the other costs associated (like overhead time to manage the kegs, keg loss, extra walk-in cooler space, and so on). Yes, we assumed some variables here. 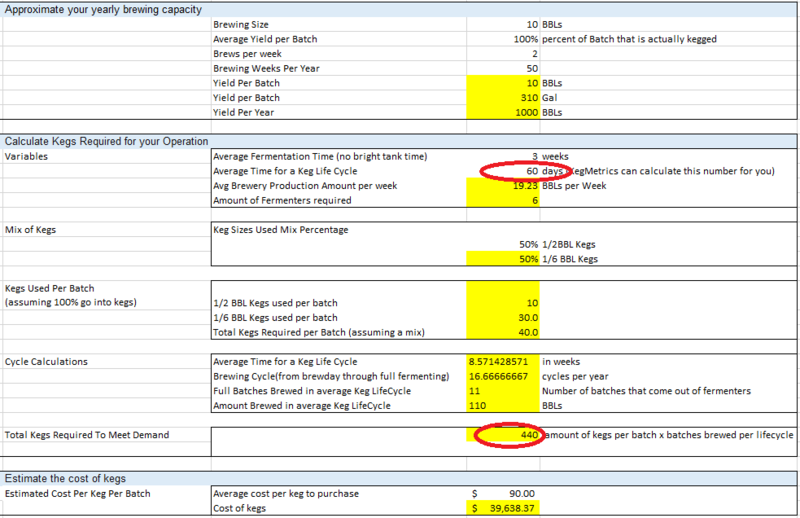 For example, we chose to put the yield per batch to 100% because of variables associated by batch, we also assumed a mix of 1/2 BBL and 1/6 BBL kegs. This of course means your results may vary but the math is essentially the same.The longer your kegs are out the more kegs you need to meet demand. This wasted time out is simply Keg Bloat. Reduce the amount of time a keg is out and you’ll see real savings. If you’ve already spent the money buying kegs you still can benefit! You could grow your output by 10% without having to buy more kegs. This basically means a higher margin and more profit!! What would it be worth for you to grow your business by 10% without having to invest in more kegs? Your numbers may vary of course. The point of this article is to highlight just how much of an impact the lifecycle of a keg has on your bottom line. KegMetrics improves cycle time, reduces keg loss and helps you sell more beer. Would you like to see KegMetrics in Action? Just click here to schedule it with me.